Sky blue. Robin’s egg blue. Turquoise. Cerulean. Navy. Denim. Teal. Periwinkle. Aquamarine. Some of these Crayola crayons are fancier sounding than others and some hardly seem blue at all (looking at you Periwinkle), but in the end, they’re all blue. Think about all the things you could draw: a house, a forest, a rainbow - all of them might use blue, but not often enough to merit a dozen varieties. In our article What Pre-med Color Are You?, we explain the importance of standing out from other pre-med candidates and avoiding their most common mistakes. Do any of these sound like you? It’s okay. Everyone is probably a little blue. But if you’re feeling too blue, we’re here to help you add a bit more color to your application, no matter where you land on the spectrum. The problem is that this approach will leave you blue in the face - overwhelmed, exhausted, begging for air. To avoid this problem, you need to give yourself a large window of studying time, make a plan to work smarter (not harder), and take care of your mental and physical health. You can probably guess what happens to our poor, weakened frog. The temperature will keep rising until the moment when it’s simply cooked to death. But what if it had been plunged into the pot halfway through boiling? The frog could have recognized the intense heat and given a powerful push with its legs to extract itself. That’s how pre-med burnout works. As a pre-med, you become so entrenched in your many obligations and activities that you lose sight of your own well-being. When things get “warmer than desired” (and you realize the problem), it might be too late to escape. Pre-meds know all about boiled frogs, and they might have even seen fellow pre-meds boiled alive. But they trust in their own ability to withstand the heat, to keep swimming, to somehow find extra strength in their frog legs. Plus, all around them, they see dozens and dozens of frogs swimming in boiling water, who seem to be surviving just fine, or maybe even thriving! If those other frogs can do it, then so can they. They will refuse to be cooked alive, but they will also refuse to be known as the frog who abandoned the pot. Are you a boiled frog? In others words, are you prone to pre-med burnout? Find out by taking our quiz: Are You a Pre-med at Risk for Severe Burnout? 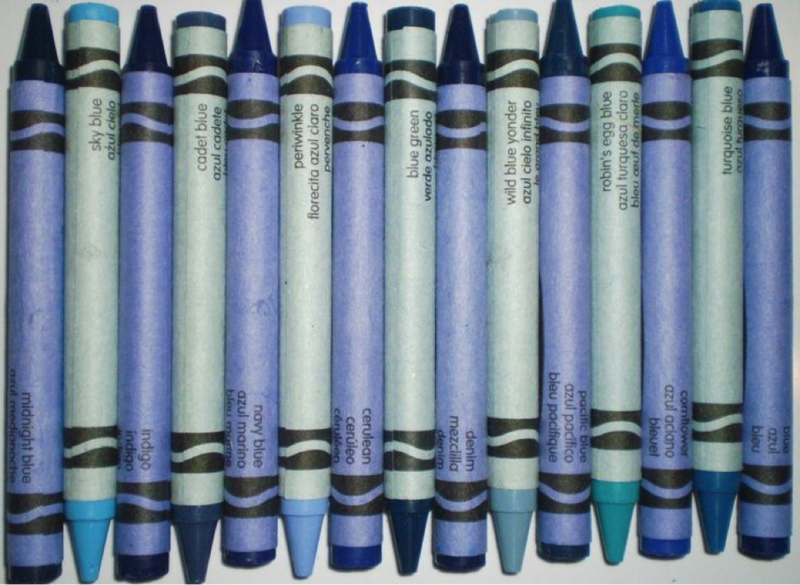 Remember all those shades of blue in the Crayola box? We forgot to mention a color called Maximum Blue (for real), which is what we imagine most pre-meds want to be. Rather than being a different color altogether, most aspire to be the bluest of them all. It’s easy to feel inferior as a pre-med, especially if you strive to be Maximum Blue. You look around your classes and see people who are smarter than you, work harder than you, who have overcome unbelievable obstacles. And then you look at yourself and feel, well, average. Nothing interesting defines your life. You certainly haven’t overcome much in your two decades and counting on this planet. How, then, can you stand out in your medical school application given that you feel so average? Find your “true blue,” which might not even be blue at all. Maybe it’s crimson, or sapphire, or tangerine. Your best bet is to take the initiative towards projects or goals that have personal relevance to you or your community - even if that means creating something from scratch. You’ve probably never heard the advice we’re about to share, and we think it’s guaranteed to help you stand out and elevate your application above the pack. A ‘capstone’ originally referred to the final stone or brick that a mason or architect would lay on a building. Over time, it took on metaphorical meaning, and people started using it to define the crowning achievement in the workplace, whether for engineers, inventors, or entrepreneurs. Capstone projects encourage students to think critically, solve problems, and develop skills that will prepare them for a career and adulthood. Many capstones are interdisciplinary, in the sense that they require students to apply skills or explore issues across different subjects. Do I have access to a large group of friends? Access to funds? What resources exist that I could use to make an impact on my community? Getting involved - Don’t be a S.M.U.R.F. Smurfs are blue, and they’re known for their mob or herd mentality, always sticking together and never straying away from their Smurfdom. Sure, they have a few distinct features, but at a quick glance they all look the same. For pre-meds, S.M.U.R.F. can be an acronym: Studious, malleable, unoriginal, ruthless, fearful. We’re not saying that all pre-meds are SMURFs, but the most uninspiring ones tend to embody these qualities, leading them to pursue activities that are equally generic. We’ve written extensively about the pre-med checklist, an important but overrated set of criteria for getting into medical school. The Smurfiest pre-meds fail to exceed the boundaries of the checklist, and they do very little to make the items on their list distinct. It’s called the Laundry List Fallacy. Most pre-meds haven’t even heard of it. The Laundry List Fallacy describes someone who’s simultaneously involved in, say, four extracurricular activities, who believes that a laundry list of different activities is a good thing. It’s not. It’s good to be involved, of course, but if the only purpose of the involvement is to check things off a list, then all the hard work you’re doing won’t help you get in. The problem with the laundry list is that each item becomes a means to an end. Rather than give your all, you just show up to do your time. You don’t give the activity respect, so you end up with an average experience. The other problem with the laundry list is that even if you check off every box, you end up looking like every other applicant to medical school. Feeling blue? Don't worry, you can change to purple or green, but you'll have to prioritize. In addition to the rest of the pre-med checklist (volunteering, leadership, etc. ), you'll have to spend time working on the things that make you different. We hope our tips help you let your true colors shine!